You could describe it as a u-turn, yet I am more inclined to call it a stay of execution. However you look at it, tax credits are going. On the surface you could see some merit in an argument that says the state should not be in effect assisting companies in their under-paying of staff. However, tax credits make work affordable for many, and the consequence of unaffordable work is welfare. It may be that this is a false saving. Having said that, I suspect that many will continue in unaffordable work. In the long run the Chancellor has changed nothing. Working families, many of them , will feel the pinch. Some, the few already subject to Universal Credit, may already be eyeing a prospect of reduced circumstances. This may be a u-turn today, but the destination remains unchanged. My last schoolboy summer holiday saw a ladybird infestation, and my tackling Stranger In A Strange Land with amateur cricket as a backdrop at the Chalkwell Park I often visited. As summer gave way to autumn, my childhood ended as my career began. I began my full-time working life in November 1976 at HM Customs and Excise. In one of those little ironies I started at Metropolitan House in Victoria Avenue (now called Victoria House), just a few floors above where I had been signing on during that summer. Alexander House, Portcullis House, Baryta House, Coleman House (subsequently C.E. Heath House), Carby House, the Prudential building, Maitland House, and an significant IT operations in Shoeburyness. I may have missed an office or two out; this is just my memory after all. Added to this, Cupids Country Club was a Civil Service Sports ground. It was the Thatcher government that saw the beginning of the decline. The job that Maggie’s minions started looks to be completed within the next five years, if reports are to be believed. Of course times change, and progress marches on. But my generation had a substantial employer in the borough, offering a career and good money. In those days we also had Access/Mastercard, a large Inland Revenue presence, significant insurance companies (including C.E. Heath, or CUACO), and manufacturers like Amstrad, Hi-Tech, Lesney – all in addition to HM Customs and Excise. Victoria Avenue was a buzzing, thriving office environment in those long ago days. Whether it will ever be thus again is debatable, even unlikely. Time marches on, but progress is not always welcome. When HM Revenue and Customs, as HMC&E is now known, finally bids adieu to Southend I think we will have lost something of value. Latest figures] show that the number of NEETs is still appallingly high. There are 943,000 young people who were not in education, employment or training for the first quarter of this year. Whilst this is a small drop on the previous quarter’s figures, it still is unacceptably high. It is a tough world, out there, for young people in the UK. Education is unaffordable for some, and we are facing having a lost generation for whom under or un-employment will become the norm. The numbers show that of this 943,000 about half are looking for work, whilst half are described as economically inactive. The so-called economic recovery clearly is not being felt by young people. Mr Cameron and his Conservative Government are presiding over a crisis for young people – a potentially wasted million lives. It ought to be a no-brainer, a question about the importance of science and engineering to the United Kingdom. In my job, as an information technology professional, I get a glimpse at the importance of science and technology. In my, thus far, thirty-eight year long working life I have witnessed huge changes in how we work, and what we work with. I have also seen the UK’s industrial base change, and now we are far more dependent on service industries. It is clear, though, that we were a market leader in the science and engineering sectors, and we still are. The challenge ahead is to keep Britain important. The twenty-first century is already seeing significant changes and challenges. Whilst the old order of Western Europe and North America is still very important, Asian and South American economies are rising. To meet the challenges that are presented by the likes of China, India, Japan, Brazil, Russia, etc, the UK has got to make sure its workforce has the skills and is able to meet the challenges that lie ahead. Education is key. Business also has to acknowledge the simple maxim of adapt and survive. This means that education does not cease with the first job, but should be an ongoing thing – and employers should encourage training. Research into new technologies, which could mean new ways of doing old things, or it could mean new opportunities, must be encouraged – and Government can help here. Research without development, though, is effectively useless. I liked it when the last Labour Government made policy to encourage more of our young into universities. I like it not that the current Government is making university a less attractive proposition. I also think that the education system must provide confidence in its examination system – employers must know the qualifications equate to ability and learning. But it is not just about getting the numbers up at universities and further education establishments – I would hope that science and engineering courses would see a rise in popularity, and a more even gender balance. Women, so it seems to me, are for one reason or another enrolling in these courses in far fewer numbers than men. It is also true of my industry, computing, that the ratio of men to women is very unhealthy. I am not a scientist, I am not even someone who reads much about science. It was not always the case. In a recent interview I was asked about my earliest favourite subjects at school. I answered that it was astronomy and palaeontology. I cannot adequately explain why I did not stick with them, or other sciences, but in part it must be down to the schooling that I had that did little to encourage here. I suspect, no I know, that the schools of today are unrecognisable from what I experienced in the 1960s and 1970s. The future must see similar levels of evolution in how we teach, what we teach, and the subjects we teach. I am no crystal ball gazer, but it does not require prescience to see that the technological revolution has a long way to go, and that this revolution has happened because of advances in science and engineering. Britain has to remain at the vanguard, or it will see the effects in lowering relative prosperity. The internet and communications are shrinking our world and making changes in every facet of life. We also have a future that has to address the issues of climate change. My belief is that new technologies, new green technologies, will become ever more important. This is an opportunity for a small island nation that clearly will be affected by rising tides (for example) to lead the way. Energy is another area that has got to see technology create new sources, or the lights really will go out. Science and engineering matter in their own right; they also matter to the UK. For Britain to remain competitive and relevant, and for this to translate into prosperity, we need new scientists and new engineers emerging from our education system, and we need employment opportunities for them to take up. 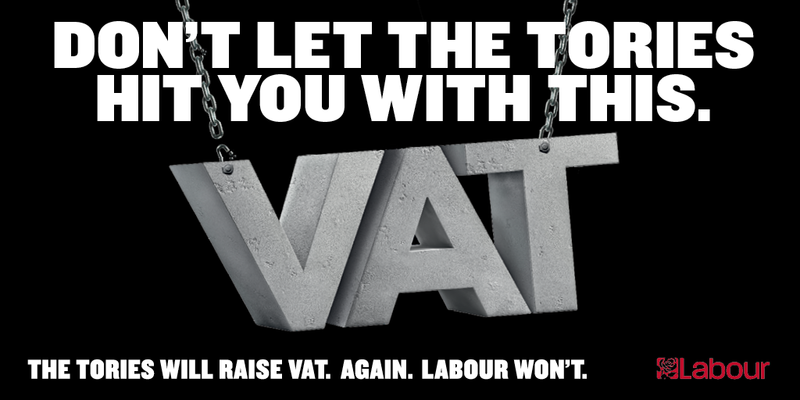 The Tories will raise VAT. Again. Labour won’t. The Labour Party supports trade agreements which can bring significant benefits through boosting trade and growth, securing and creating jobs, and bringing down costs and extending choice for consumers. The Transatlantic Trade and Investment Partnership (TTIP), a trade agreement between the US, the world’s largest economy, and the largest single market, the EU, has the potential to bring significant benefits. Europe and the United States are the UKs’ most important markets today. Indeed, the US is the UK’s biggest export market and likewise the UK economy attracts a significant level of Foreign Direct Investment (FDI) from across the Atlantic. That’s why we support the principles behind these negotiations and recognise that more and better trade is good for the UK. Reducing barriers could for example help our car industry export more vehicles to the US where there are regulations inhibiting this and negotiations could remove. • Public services: we share the concerns about the impact that TTIP could have on public services encouraging commercialisation, particularly in the NHS. Labour believes that the NHS and all public services need to be more, not less, integrated. That is why we believe that the NHS should be exempt from the agreement. Other countries have sought to exempt areas from the agreement but this Government has not done this. Labour will continue to press for exemption. • Investor State Dispute Resolution(ISDS): this is a dispute mechanism, commonly used in trade agreements and bilateral investment treaties. It allows investors to take proceedings against a government that is party to that trade agreement. If the government is found to be in breach of the obligations, the investor can receive redress. There is a major concern that the ISDS provisions could hinder our plans to reverse the privatisation of the NHS as it could result in those companies seeking compensation for loss of potential earnings. We believe that it is a right of governments to be able to legislate in the public interest and this should be protected effectively in any dispute resolution mechanisms. The European Commission has instigated several changes which have improved the transparency of the agreement which Labour welcomes. However, it is right that the European Commission has decided to temporarily suspend negotiations on ISDS until the final stages of the negotiations. Labour will be urging the Government to use this opportunity to call for far greater transparency around an exclusion for legislation in the public interest, like the NHS. • Standards: the benefits of any treaty must filter down to employees and consumers. Treaties can cement and even increase labour, consumer, environmental and safety standards. Concerns have been raised that TTIP could reduce standards, although the principle behind the treaty is to keep or raise standards rather than reduce them. Labour will only support an agreement that avoids a race to the bottom and promotes decent jobs and growth and would safeguard standards. • Non-inclusion of the US States: A significant stumbling block has been raised that the US states are not covered by the agreement and therefore procurement will not opened up. This mean we could be at a disadvantage as our markets are opened up but not to the same extent in the US. This is important because significant procurement spend in the US is at the State level. A number of worries similar to our own have been raised by member states and these would need to be reflected to secure agreement and will need to be taken on board by the European Commission.